- Replace conventional infrared sensing systems for superior accuracy, reliability, and low cost. - Replace contact temperature sensors for noncontact measurement of actual product temperature instead of oven temperature. - Retrofit using existing PLC analog inputs (4-20 mA, 0-5 V, 0-10 V). - In-line t/c.XMTR design is only slightly larger than the cable and requires no mechanical support. - Precalibrated for thermocouple type and temperature range eliminates all adjustments, requirements for simulators, etc. *For OEM’s, IRt/c’s and t/c.XMTR can be factory supplied wired together. - Hermetically sealed stainless steel construction is suitable for the harshest service without any additional packaging. - Use any existing wiring, including thermocouple, RTD, etc. 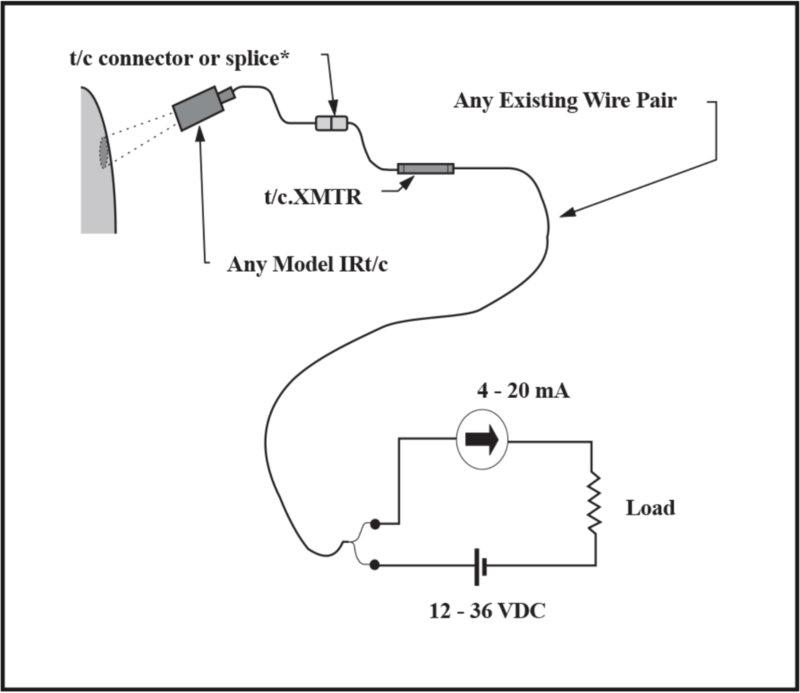 The t/c.XMTR is specifically designed to interface to any model IRt/c (or any conventional thermocouple) by a simple thermocouple connector or splice. The 2-wire current loop can be used in any conventional current loop, 0-5V, or 0-10V circuit that is scaled for the temperature range of interest.